This year's Gran Canaria Desktop Summit is hosting both the Akademy 2009 and the GNOME Users' And Developers' European Conference (GUADEC) on the Canary Islands from July 3 through 11. A speaker at the conference on its first day was Free Software Foundation (FSF) founder Richard Stallman, who espoused his usual views on free and proprietary software. Developers should look beyond technology at the social impact of computer use, he said. Free software empowers users, while proprietary software disempowers them -- much like the colonialism of the past centuries. In this connection, Stallman warned all those assembled against introducing Microsoft's C# Web technology, which is burdened with patent issues. 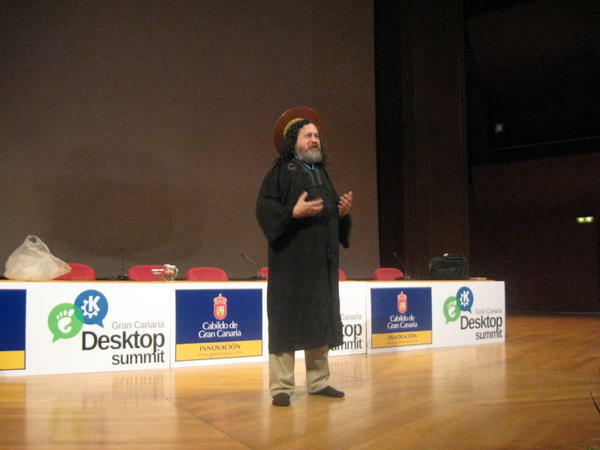 FSF Founder Richard Stallman appears in holy man's garb at the Summit. Stallman's talk also expounded on the problematic past of KDE, whose Qt GUI toolkit was not always free software. GNOME was originally considered the free alternative. The issue disappeared since Qt's licensing under GPL, but the GNOME project continues still. The result, per Stallman, is the two great, free desktop projects. He ended his talk robed as the now legendary St. IGNUtius of the Church of EMACS of GNU folklore, encouraging all to sing the Free Software Song in 7/8 beat. Robert Lefkowitz of the Association for Computing Machinery (ACM) presented a refreshing portrait of free software in his keynote. 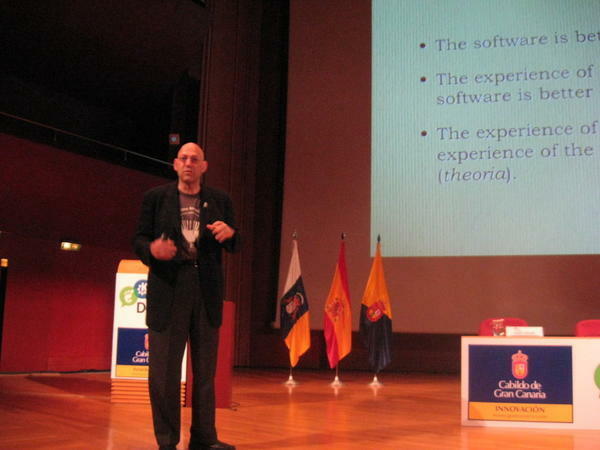 He didn't title it "Free Software" or "Open Source," but rather "Liberal Software." Breathing some Greek antiquity into the subject, he postulated that the open source world was not so much the result of a technology (techne, but about an improved process (praxis), even the philosophy behind such an improved process (theoria). Software, according to Lefkowitz, is a work of art, so that copyrights instead of patents apply. In other words, software is like good literature or rhetoric. Code lines are like lyrics and, as with spoken language, programming is about ideas expressed with the help of symbols. The open source community, per Lefkowitz, is a society exchanging knowledge, as in art. He summarized it as such: liberal software means "a program that an educated gentleman would use." "Software that an educated gentleman would use": Robert Lefkowitz merging classic education with open source at the Summit. Walter Bender of the Sugar Learning Platform tried to win over hearts at the Gran Canaria with his project originally developed for One Laptop per Child (OLPC). The Sugar software is currently used by around one million students worldwide to help them "learn to learn," such as in a current major project in Peru. Open source is especially good for pedagogical reasons, said Bender. It's freely distributed and is based on a culture of sharing. Always best to try things on your own and collaborate with others, a key tenet of Open Source, he suggested. To conclude, Bender appealed to desktop developers by showing how he created his presentation via the Turtle Art Sugar application. He also offered a wish list for the remainder of the conference: better Scalable Vector Graphics (SVG) support, internationalization tools, history and archiving functions, and desktop collaboration tools. In the end, these are features that all projects -- be it KDE, GNOME or Sugar -- would welcome.